Aid agencies continue to raise money by portraying Bangladeshis as helpless victims displaced by climate change who need our charity. But that is wrong, Joseph Hanlon argues in a new book, because it totally misunderstands the ecology and history. 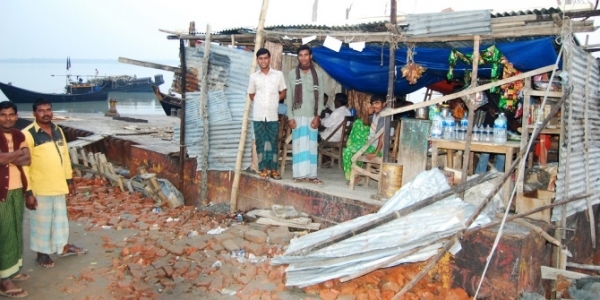 Bangladesh is hugely vulnerable to climate change, but refuses to be a victim. Bangladesh confronts climate change: Keeping our heads above water, by Manoj Roy, Joseph Hanlon, and David Hulme, will be launched Wednesday 16 November at 18.00 at the LSE New Academic Building 2.06. Bangladesh is densely populated but is able to feed itself because it is on a rich delta. However there are huge climate variations within this small country; weather and floods vary dramatically from one year to the next. Flood waters often pour down from the Himalayas and devastating cyclones come up the Bay of Bengal. Bengalis have been adapting to this difficult environment for centuries, but the real advances have only come in the 45 years since independence. Cyclone protection is the most dramatic change, yet is probably least known outside the country. There have been three ‘super cyclones’ in the past 50 years with wind speeds over 222 km/h: Bhola in 1970 killed up to 500,000 people; Gorky in 1991 left 138,000 dead. Sidr in 2007 killed 3,363 – still too many, but less than 1 per cent of the fatality rate of 1970. This huge drop is due to national actions – better early warning, cyclone shelters and higher coastal dykes. Climate change is a very real threat and if it is not checked, will have devastating consequences for Bangladesh in the form of sea level rise and more damaging cyclones and floods. Bangladeshi scientists, government officials and communities know what to expect from climate change, and for two decades they have been active in international climate change negotiations, trying to slow global warming. They will play an important role in the next round of talks in Marrakesh, Morocco 8-17 November. And the country is already adapting to expected climate change, better flood protection, improved rice and other crops, and methods to deal with sea level rise. Thus when aid agencies talk of helpless victims displaced by climate change who deserve our help, they are wrong in three ways. First, Bangladeshis are not helpless victims – they are active in adapting to climate change and in campaigning for reduced greenhouse gas emissions. The second mistake is the charity approach. Bangladesh did not cause climate change, so the country does not need “aid”; instead it needs compensation for the damage already done – an important success of Bangladesh’s negotiators was to put the concept of “loss and damage” into the agreement at least year’s Paris climate change conference. The third error is more complicated. Oxfam and Christian Aid talk of climate change refugees; even DfID says that Bangladesh is “already experiencing the effects of climate change.” But that is not true. Bangladesh has had environmental refugees due to floods and cyclones for centuries. The climate in Bangladesh is hugely variable. The worst flood in a century was in 1998 when 68 per cent of the country was flooded, but that flood came only four years after the driest year, 1994, when a mere 0.2 per cent of Bangladesh was flooded. Scientists can show that climate change is having a steady impact, but so far the changes are too small for people to notice. The floods and cyclones are not worse – yet. But in the decades to come, they will be, because the greenhouse gases already emitted will remain in the atmosphere and continue to increase temperatures. So what should aid agencies do instead of asking for charity for non-existent helpless climate change refugees? Their first responsibility is in Britain and the United States – convincing their own governments that only through much more substantial cuts in greenhouse gas emissions will they prevent the creation of climate change refugees. Second, agencies should stop asking for charity, and instead ask people in industrialised countries to pay for the damage already done. Third, they should link more with Bangladeshi scientists, engineers and community activists who are already pushing forward on climate change adaptation; they know what to do, and do not need advice, but Bangladesh is still a poor country and it does need money. Joseph Hanlon is a visiting senior fellow at the LSE Department of International Development. Bangladesh confronts climate change: Keeping our heads above water is published by Anthem and will be available from 21 November, and at the 16 November launch. Review copies from j.hanlon@lse.ac.uk. Dear Joseph, I work for Christian Aid. We were interested in your article and wanted to share our perspectives in response to some of your comments. In Christian Aid’s international development work, it has never been the intention to treat people as helpless victims, nor portray them as such. Rather, our work with and through local and national partner organisations in Bangladesh as elsewhere has over many years aimed at empowering poor communities to respond to the various challenges they face, including through measures to reduce disaster risks, make the most of economic opportunities and call on local and national government structures to deliver appropriate infrastructure and services where they are most needed. We have a longstanding commitment to supporting local organisations and community-led approaches, with a common aim to enable the most vulnerable to further their own development. Alongside practical measures to improve wellbeing therefore our partners, which include Nijera Kori, Nagorik Uddyog and the Christian Commission for Development of Bangladesh, also promote the inclusion and participation of women and marginalised groups such as Dalits and ethnic minorities. When it comes to climate change, we are aware of the challenges of attributing extreme weather and incremental changes to anthropogenic impacts, and are working closely with the scientific community to better understand the complex linkages. Our approach to environmental shocks and stresses, such as riverine and coastal flooding, soil salinization and erosion has been to build resilience. We do this in the knowledge that while these are natural features of Bangladesh’s unique geography, they will be exacerbated by climate change impacts such as rising sea levels and surface temperatures and extreme precipitation. Also, because as you have noted growing populations are exposed to the associated risks, and they need to protect homes, businesses and resources on which they depend. Our work therefore focuses on reducing the risks, through measures such as afforestation, construction of safer homes and introduction of saline-tolerant crops, as well as raising awareness of how communities can diversify their livelihood options and organise to reduce risk and protect themselves. We have pioneered this risk and resilience work across many of our country programmes and continue to develop it. We couldn’t agree more that developed countries are responsible for providing adequate financing to address the impacts of climate change. Our campaigning work has for many years called for the UK and EU to play a leading role in an ambitious global climate agreement, reduce emissions commensurate with global equity and meet their pledges on climate finance, in additional to aid. We would argue that there is still a place for international aid, and that the ‘silos’ of humanitarian, development and climate finance need to be broken down so that these work better together on the ground. Alongside our partner organisations we have strongly advocated for greater funding for disaster risk reduction and resilience policies, and we continue to support local partner organisations to access funds and build their capacities to respond to risks and to disasters when they occur. Repeated experience has shown that, when disaster strikes, local organisations are best placed to respond in a timely and effective manner. This was widely recognised during the recent World Humanitarian Summit, as part of which Christian Aid strengthened its commitments to invest in community resilience and local capacities, based on an understanding of changing risks, informed by science. In relation to the notion of ‘climate refugees’ we agree that the term is problematic. However, as you have noted, climate change is a very real additional factor that could contribute to displacement, over and above others such as protracted conflicts and pressure for land and resources. Our experience has shown that in general, people do not want to leave their homes and prefer to strengthen their ability to cope with the problems they face, but we also increasingly see communities that have been overwhelmed by repeated disasters, resulting in the total loss or gradual erosion of assets and human capacities to the extent that many members have little option but to seek an alternative safe place to call home. Low-lying coastal and island states are already facing irreversible damage in which relocation and resettlement may be their only options, and at the worst end of climate predictions very large regions may become inhospitable and even unliveable. The inadequacy of existing conventions to guide a human response to such displacement is clear. In all our work, Christian Aid seeks to amplify the voice and influence of affected communities, for example, by supporting Bangladeshi partner organisations to document and disseminate through global platforms the social and economic loss and damage associated with disasters. We aim to ensure that our local partners, and the communities they work among, are agents for change and inform our policy and advocacy work; and where possible we aim to highlight their work. For instance, we continually profiled the work of local partner organisations, faith leaders and affected populations during the process of the World Humanitarian Summit. They have indeed refused to be victims, and we are inspired by their activism and commitment. We’d be happy to continue this discussion, so please get in touch with me directly if you’d like to find out more about any of the above or our work more generally.